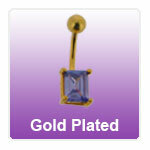 Gold plated belly bars and belly rings. Great selection of belly button rings with jewels and then gold plated. Get the look of real gold body jewellery but with a great lower price.